Where: The Pavilion at Ole Miss – Oxford, Miss. FAYETTEVILLE – Arkansas stays on the road for another contest versus a top 25 program as the Razorbacks travel to Oxford, Miss., to face #18 Ole Miss on Saturday (Jan. 19). Tip-off is set for Noon and the game will be telecast on the SEC Network. This will be the 80th meeting between Arkansas and Ole Miss. The Razorbacks own a 47-32 advantage in the series. However, Ole Miss leads the series in games played in Oxford, 19-8, as well as games played since Arkansas joined the SEC, 26-25, for the 1991-92 season. Other than Texas A&M, who Arkansas faced as members of the Southwest Conference from 1924-91, Ole Miss is Arkansas’ most common SEC opponent. The first 19 meetings between the schools (1938-68) and 25 of the first 28 meetings were played at neutral sites — Little Rock, Memphis, Shreveport, La., Pine Bluff and Blytheville. Arkansas’ current four-game stretch is the toughest in the nation. Starting with a loss at #3 Tennessee Tuesday, Arkansas will now play at #18 Ole Miss, host Missouri and play at #8 Texas Tech. No other team in the nation will have played three road games versus top 25 teams over this same span — two of which are in top 10. Arkansas won its SEC opener but has dropped the last three for a 1-3 start in the league. In each of the previous two seasons, Arkansas was also 1-3 to start SEC play. Last season, after a win over Tennessee to start conference action, Arkansas lost its next three to start 1-3. Arkansas ended the three-game slide with a home win over Missouri but lost the next game at Florida for a 2-4 start. From that point, Arkansas went 9-4, including a win in the Big 12/SEC Challenge, to end the regular season. In 2017, Arkansas was also 1-3 to start SEC play before going 11-4 the rest of the regular season, including a loss in the Big 12/SEC Challenge. The Sporting News announced its 2018-19 Midseason All-American this week and Arkansas sophomore Daniel Gafford was selected to the third team. 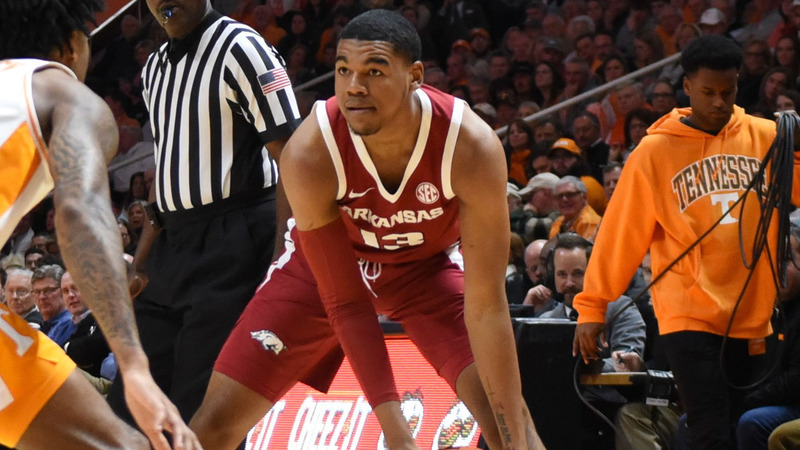 Gafford and Tennessee’s Grant Williams were the only two SEC players on the 15-member team. In SEC play, Mason Jones is averaging a team-best 19.8 points and averaging 5.0 rebounds. He leads the team and ranks second in the league for scoring in SEC games while ranking second on the team in rebounds and assists. Isaiah Joe has made at least one 3-pointer in 15 of 16 games and made at least three 3-pointers in a game 10 times this season. He ranks 11th nationally and first in the SEC by making 3.63 from beyond the arc. He also leads all freshmen in the NCAA in 3-point field goal percentage (.443) while leading all SEC freshmen in scoring (14.3). Reggie Chaney as blocked a shot in 15 straight games. He did not block a shot in the opener versus Texas. After playing at Ole Miss, Arkansas will return to Bud Walton Arena to host Missouri (Jan. 23 at 8 pm on SEC Network). For more information on Arkansas Men’s Basketball, follow @RazorbackMBB on Twitter.